if everybody becomes YO (yoshi obsess) and equal on that planet there won't be poor and rich so yoshimitsu will lose is job >:( , i say we take half the planet and the other half is for aventure in the "wild" non-YO side Xd. 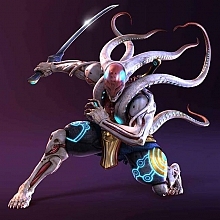 The warrior as Yoshimitsu himself pursues his goal to make people realise they're equal in all aspects. He would gladly stop fighting the moment they realise this and, which is even more important, live the peaceful lives in harmony with nature. But unfortunately, people live in chaos and do countless mistakes. So people similar to Yoshi are quite needed. Anyway, if all the over-rich people realised they're actually unhappy with their possessings, and that it's the rich people's money which actually possess them and limit their freedom, they could possibly do something with their lives. It's sad that with all their possibilities, most of rich people show no interest to other fellow human beings. Our Euro-American culture is full of mistakes. is quite nice. The singer reminds me of Lili! Not only the name, but her appearance and the huge house similar to Lili stage. The similarity is striking. But the presence of "bad guys" isn't good in any way... I guess you were lucky enough not to meet evil guys. i did martial art for like 13 years and my teacher once said that" evade the fight is the best way not to get into one ". about risking their life, its crazy but some (not all of them) do enjoy the adreline rush of being in danger. did you know some people get tattoo and pierce just for the pain? if we talk reality wise, absolute peace is impossible there is always gonna be someone thats gonna be bad or evil, so you need to keep fighting. like that paul stanley song XD: live to win! till you die! till the light dies in your eyes! About the adrenaline thing.. sure people do get addicted to it but come on... Yoshi??? Really?? Surely he is more disciplined than to give in to such basic animalistic urges (unfortunately :blush). Anyway... this is just my opinion and hey, it's not fair that it is 2 against one... come on.. someone reading this must surely agree with Kage's theory, aren't you gonna back him up??? I don't mean to be argumentative though -maybe I just do it for the thrill?? Sorry, I am just being silly now... will someone please come and remove my hands from the key board... come on guys and gals, I'll be typing all night if you dont. I don´t think evading fights is the right thing to do. I think this is the source of many problems in this world, no, I mean the reason they still exist. I´m not only talking about hand-to-hand combat stuff, but about "fighting" as standing up against oppression, discrimination, racism, greed, hunger and all those things. And even if it´s on the streets, when some drunk punks beat up others again, why not interfere ? Peace and freedom are nothing more than mere illusions anyway! And even if it´s just for my own pride, I don´t wanna be a person that backs down, no matter what the consequences are. Cause as soon as we see or know, we have a responsibility, that´s my opinion. Anyway, u can´t win fights without fighting...it´s just not possible! hehehehe... though I dont play much at all right now Dunno why, maybe it's just the winter. I bet once spring is here I'll be watching that wiggle 'til my heart's content!!! But it might also be those addictive licorice mint Mentos that taste so damn good! Hehehe, just what am I talking about ?! Can someone please make a more useful post now ^^" ? *Yoshi :3 <--- useful post improved!